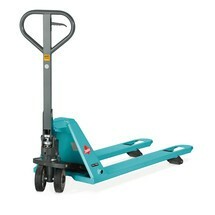 With an entry height of just 51 mm, the Ameise® low-profile hand pallet truck with 1150 mm fork length is ideal for transporting low special pallets, flat pallets or special rolls. Benefit from proven and robust Ameise® quality: The flexible hand pallet truck with 1500 kg capacity is designed for continuous daily use. 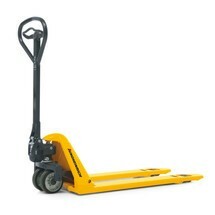 The Jungheinrich AM 15l low-profile pallet truck with 1,150 mm fork length is designed for the daily transport of special and flat pallets with a low entry height. You benefit from energy-saving pump hydraulics, robust welded construction and maintenance-free operation. 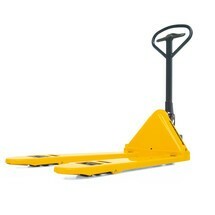 The Jungheinrich AM 15l low-profile pallet truck with short forks is designed for the daily transport of special and flat pallets with a low entry height. You benefit from energy-saving pump hydraulics, robust welded construction and maintenance-free operation.